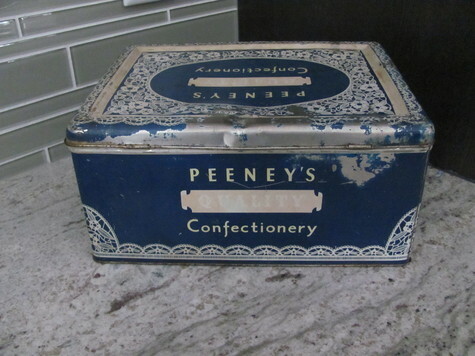 1940's vintage metal tin; Peeny's Quality Confectionery Candy from Peeney & Sons Ltd., England. Lace Design - used vintage condition with some worn spots. Approx size: 10 1/2" x 7 3/4" x 5" high; hinged lid. Located in Spruce Grove, Alberta. Asking $25 firm.